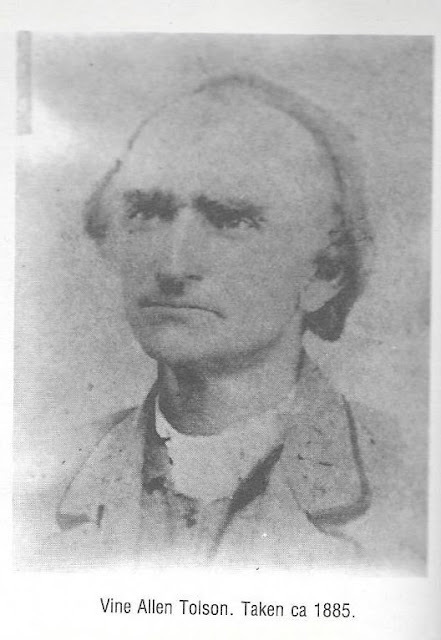 Vine Allen Tolson was born 1812 in Craven County, NC. His parents were George Tolson (b. 1775) and Sally Whitford. In my post, What Did Mortimer Mitchell See?, I mentioned how I thought Vine Allen Tolson was the uncle of Elizabeth Hardison Williams. Elizabeth Hardison Williams sold land to my 3rd great grandfather Mortimer Mitchell back in 1878. Well it turns out she was actually his half sister. From the records I've found it looks like George Tolson was married 3 times. 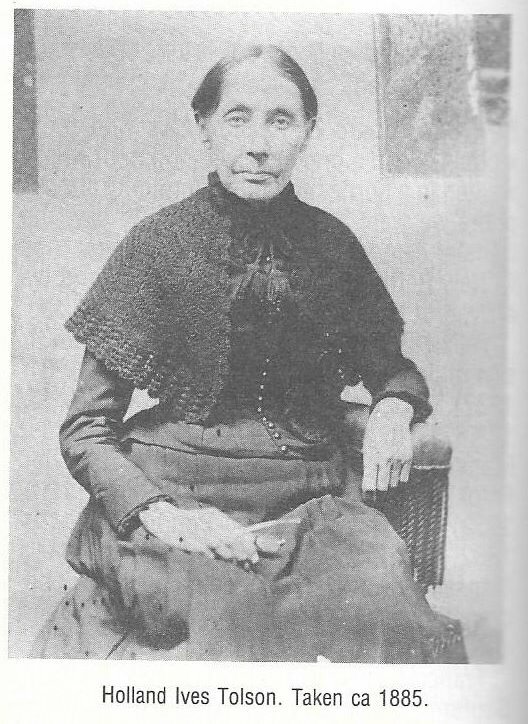 His last wife was Margaret Smith who he married on November 7, 1825 and it was she who was the mother of Elizabeth Hardison Williams. Now why do I bring all this up you may ask? I just wanted to clear up my earlier mistake. So was I able to find any connection between Vine Allen Tolson and Alexander Mitchell? There wasn't any link via marriage between the two families. There was however, a connection via land. Lucky for me, Craven County Register of Deeds has an online portal where I was able to access deed information for Alexander Mitchell and Vine Allen Tolson. Check this out. Okay well it's not Alexander Mitchell's name I have marked here but rather his son Thomas J Mitchell. Here's the low down with what went on with the first entry noted in red. It appears that Vine Allen Tolson came upon hard times around 1868 and fell into debt to Alexander Mitchell. The following is a trust deed that was created between Vine A Tolson and Thomas J Mitchell with Alexander Mitchell listed as witness. 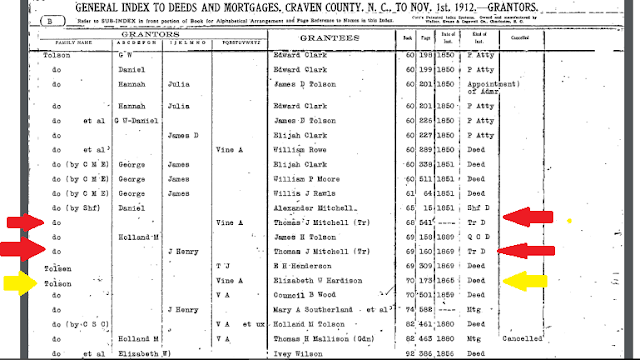 From Real Property Book 68, Pages 541--543 at the Craven County Register of Deeds. Where as Vine Allen Tolson the undersigned grantor am honestly indebted to Alexander Mitchell in the sum of eight hundred and sixty six dollars and ninety eight cents ($866.98)where as the said Alexander Mitchell has instituted a writ in the Superior Court of Craven County for the recovery of said debt and where as a judgement has been obtained against me in the Court of Pleas and Quarter Sessions for the County of Wayne at the writ of William Hollowell for the use of D C Carrington upon which execution has been inferred to the Sheriff of Craven County by virtue whereof he has levied upon the whole of my estate real and personal and proposes to sell the same or as much thereof as may be necessary to satisfy said execution on to ( ? ) said debt and cast amounting in all to the sum of one hundred and fifty nine dollars and forty six cents and where as I am wholly unable to pay said debt at the present time or to procure a postponement of said sale and if the said sale should take place I will be entirely delivered of the only means whereby I can reasonably expect to raise sufficient money where with to support my family and pay my debts and whereas I honestly believe that if the said execution can be satisfied and time is allowed me until the first day of January next to carry on my farming operations I will be able to pay with my earnings from my plantation the whole of my debts and whereas the said Alexander Mitchell has agreed for the purpose of enabling me to do so provided he can be secured against loss to pay and satisfy said execution and discontinue the said writ instituted by him against me and to allow me time until the said first day of January next wherein to pay the whole of my indebtedness to him which is the aggregate amounts one thousand and thirty dollars and sixty seven cents ($1030.67) for which now I have given my note of ( ? ) date herewith payable with interest on the said first day of January 1869. 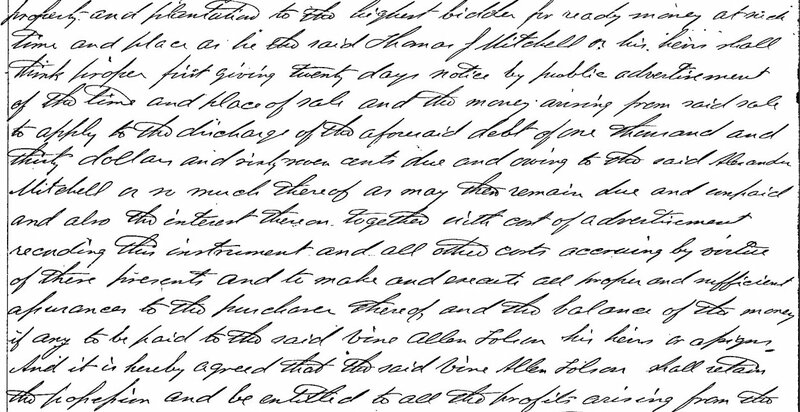 Therefore this indenture made this fifteenth day of May in the year of our Lord one thousand eight hundred and sixty eight between the said Vine Allen Tolson of the County of Craven and state of North Carolina of the first part and Thomas J Mitchell of the city of Newbern County and State aforesaid of the second part and the said Alexander Mitchell of the last named city of the third part witnesseth that whereas the said Vine Allen Tolson is honestly indebted to the said Alexander Mitchell in the sum of one thousand and thirty dollars and sixty six cents due by note bearing date of the date hereof which he the said Vine Allen Tolson honestly desires to secure and pay in consideration thereof and of the sum of one dollar to the said Vine Allen Tolson in hand paid by the said Thomas J Mitchell the receipt whereof is hereby acknowledged in full the said Vine Allen Tolson has bargained sold assigned and conveyed and does hereby bargain sell assigns and convey to the said Thomas J Mitchell for the purposes herein after named the following articles of personal property viz seven cow, two heifers and one bull one black mare two years old four sow with their pigs and two carts and doth further give grant bargain sell and deliver and by there presents hath given granted bargained sold and delivered to the said Thomas J Mitchell his heirs and assigns forever for the purposes herein after named the following described real estate constituting the plantation on the south side Neuse River at and near Croatan Station on the Atlantic and North Carolina Rail Road Eleven miles from Newbern now occupied owned and cultivated by said Vine Allen Tolson containing 715 acres of land bounded as follows viz by land of John C Washington and others on the south east by land of Bell and others on the north by land of heirs of Stephen Hardison on the west by land of Jones heirs and land of B F Williams and John L Williams John C Washington and others to have and to hold the above described ( ? ) parcels of land and every part thereof with all the right privileges and appurtenances thereunto belonging or in anywise appertaining free and clear from the lawful claim or claims or incumberances of any person whatever onto him the said Thomas J Mitchell his heirs and assigns forever. In trust, nevertheless that the said Thomas J Mitchell or his heirs shall and may at any time after this the said first day of January next sell the above enumerated personal property and plantation to the highest bidder for ready money at such time and place as he the said Thomas J Mitchell or his heirs shall think proper first giving twenty days notice by public advertisement of the time and place of sale and the money arising from said sale to apply to the discharge of the aforesaid debt of one thousand and thirty dollars and sixty seven cents due and owing to the said Alexander Mitchell as much thereof as may then remain due and unpaid and also the interest thereon together with cost of advertisement recording this instrument and all other costs accruing by virtue of these presents and to make and execute all proper and sufficient assurances to the purchaser thereof and the balance of the money if any to be paid to the said Vine Allen Tolson his heirs or assigns. 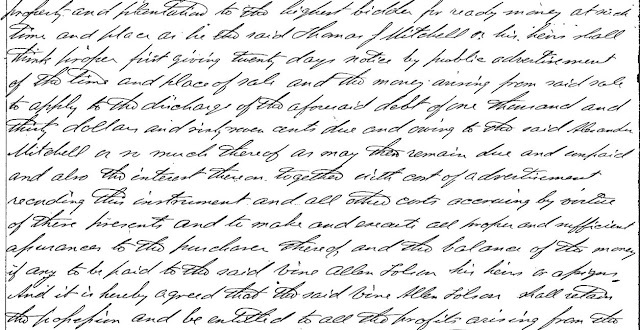 And it is hereby agreed that the said Vine Allen Tolson shall retain the possession and be entitled to all the profits arising from the above enumerated personal property and plantation until the said first day of January 1869. In witness whereof we the parties above named have hereunto set our hands and seals the day and year first above written. Now did Vine Allen Tolson pay off his debt by January 1, 1869? We'll find out in my next post.